Holy basil, Ocimum sanctum, is an ancient herb used in ayurvedic medicine. In India, it is known as tulsi, and is grown for its many perceived health benefits. Holy basil has started to gain popularity in Western countries because it may have the ability to lower cortisol levels related to stress, and even help us to lose weight. But since there few studies on its long-term side effects, be sure to talk to your health-care professional before taking holy basil. Holy basil was introduced to the West in 1701. In its traditional use in ayurvedic medicine, holy basil is thought to be fever reducing, antioxidant, anti-parasitic, digestive aiding and nerve calming. It is also thought to strengthen the immune system, enhance the memory and fix many eye disorders. These many perceived benefits to the plant are the reason you can find it growing all over Hindu temples. Holy basil comes in both a red and green variety. Much like its sweet basil cousin, it has a strong and pleasant aroma. Unlike sweet basil, it doesn't have many culinary properties, although it is often used in Thai cooking for its strong clove flavor. Holy basil grows 2 to 3 feet, is bushy and produces purple flowers. It prefers full sun and can grow in planters. When you are stressed, you enter the fight or flight mechanism, and your body shuts down its rest and repair mechanisms and increases the amount of cortisol and adrenaline in your body. Cortisol is helpful for a short amount of time, but when you remain stressed for an extended period of time, these altered cortisol levels can lead to weight gain and many other physical problems. Many people who are often stressed start to gain weight from the elevated levels of cortisol in their systems. 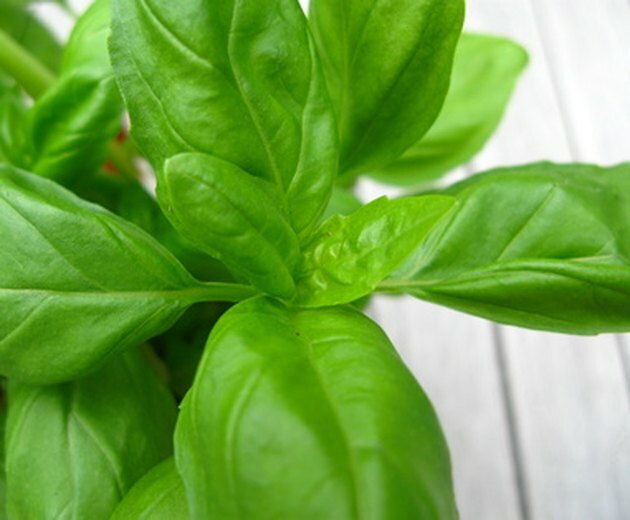 Holy basil has been shown to lower blood pressure and cortisol levels. If holy basil is taken along with a healthy diet, breathing exercises and aerobic exercise, it is possible to greatly reduce cortisol levels in a small amount of time. In a study published in 1991 in the "Indian Journal of Pharmacology," holy basil was shown to be the safest and most effective way of reducing stress when compared to Siberian ginseng and Asian ginseng. Since holy basil has been used for centuries in India and is still used, it is probably relatively safe. However, there have not been many studies done on the side effects, especially the prolonged effects. Always talk to a doctor before taking a health supplement for any extended period of time. Holy basil may slow blood clotting, so don't take it with other medications that also slow clotting. Weil: Holy Basil to Combat Stress?